The Boy Scouts of America is a nationally chartered organization that encompasses Cub Scouts, Boy Scouts, Venture Crews, and Varsity Units. This is the group of adult volunteers who "run" the Pack. Any interested adult is welcome to attend Committee meetings. They are responsible for the administration of the Packs activities. The Council is an organization of professional Scouters that oversees all Cub Scout Packs, Boy Scout Troops, Venture Crews and other units in an area. Pack 101 is part of the Greater Western Reserve Council. The Den is a group of Cub Scouts who meet at regular intervals. Ideally, a den consists of 6 to 8 boys who are all working toward the same rank. Each Council is divided into a number of Districts. Pack 101 is part of the Arrowhead District. 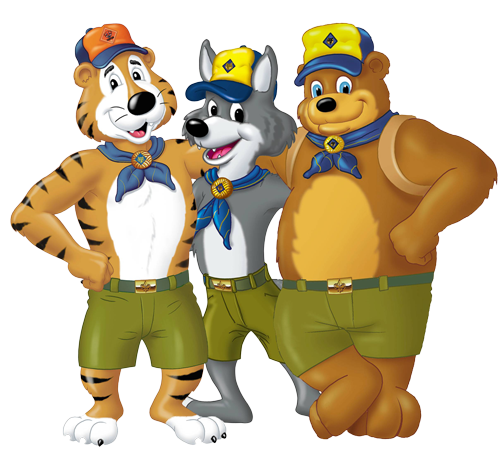 The Rank Badges, in order, are: Bobcat, Wolf, Bear, and Webelos. Each Unit must have a sponsoring organization, such as a church, service club, etc. Pack 101 is sponsored by the Blessed Sacrament Church. Tiger Cubs are first grade boys who, with an adult partner, participate in several of 17 Big Ideas. The Tiger Cub program serves as an introduction to the Cub Scout program. Tiger Cubs and their families are often encouraged to participate in Pack events. The Uniform is the prescribed clothing for any and all official Cub Scout events. In Pack 101, the minimum Uniform consists of a uniform shirt, (with all patches), appropriate neckerchief, and blue jeans, pants (or shorts). Webelos Scouts use the "colors" for activity pins. For "casual" events, a Cub or Webelos Scout T-shirt and shorts is acceptable. Webelos means WE'll BE LOyal Scouts. The adult volunteer who is in charge of planning and running den meetings and activitiesis the Webelos Leader. These are generally second grade Cub Scouts, who work on 12 Achievements, mostly in the den setting. Arrow Points are awarded for work done on a multitude of electives. Each individually chartered Pack, Troop, Crew or Lodge is a Unit.